Which means Halloween isn’t far behind. I love fall, the cooler weather, friday night lights, etc. Most of all I love me some halloween, I was the quirk kid whose costumes never really made sense to anyone but her. I usually made them from things I had around the house. No this post isn’t about the boys and my costumes which for the record, I need to get going on and will me awesome. It is about painting pumpkins with Ian. It didn’t go how I imagined, he was very wary of sticking his fingers in the paint I had out. 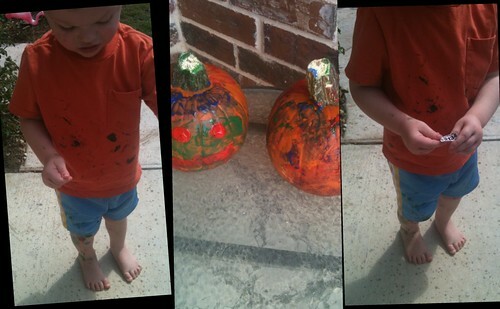 He wanted to squeeze the paint directly on his pumpkin and then put his fingers in it. I think he got more paint on him then his pumpkin. All in all though it was a fun adventure. This entry was posted in craft, Fall, Halloween, Ian. Bookmark the permalink.